Does the business for the Qwerty customer? 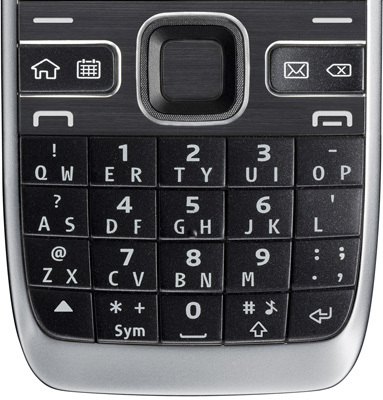 Review The Nokia E55 is actually one of a pair of very similar handsets simultaneously released by Nokia. Its brother is the E52, which is pretty much the same, except that it has a standard numeric keypad rather than the E55's SureType-style Qwerty keypad with two letters assigned to each key. That aside, both phones come with Wi-Fi, HSDPA 3G, a 3.2Mp camera, aGPS, FM radio and an outsize battery. Nokia is claiming that the E55 is the world's thinnest smart phone, which, much like world-class sprinting, is a contest that is increasingly based on very small margins. For the record, Nokia is quoting it as 9.9mm thin, which cuts a mighty 0.1mm off the 10mm E71. No, we couldn't tell the difference when we held them next to each other, but do let us know if you think it's significant. It's a neat looking device, with chrome-look trim around its plastic frontage and a metallic backplate. Incidentally, this feels a little flimsy, and even came off in our pocket once. The 2.4in screen offers 320x240 resolution and 16 million colours. It's bright and sharp, as you might expect, and not bad in sunlight either. Below the display are two programmable soft keys and – crammed in on either side of the square, five-way navipad – are four shortcut buttons: home, calendar, messages and a back/delete key. The two on the left can also take you to other functions by long-pressing them. The navipad also does that continuous pulsing light thing we've seen on the E71 and E66, which flashes when you have a message waiting or receive a call. Call start and stop buttons separate this array from the four-line, 20-key alphanumeric keypad below. It is neatly laid out, but the buttons aren't very distinctive, with a very short travel distance and not much in the way of a click. The result is that it can be a bit tricky to tell when you're connecting. It's not disastrous, but it's certainly not ideal on a phone that makes a virtue of messaging, though we did find ourselves getting more accustomed to it with extended use. That aside, it's easy enough to get the hang of the two-letters-per-key set-up, and while it's not quite the full Qwerty shilling, it'll give you the edge on standard keypads, making it a decent compromise.